Rain Water Harvesting is becoming more and more popular as people across the country (see note below on Colorado water law) look for sustainable methods of conserving our most precious resource – water! Thousands of gallons of water flow from a single roof to the stormwater drain every time it rains without ever being put to any beneficial use. Rain Water Harvesting involves capturing this water and using it for irrigation or as part of a decorative water feature. In addition to the conservation benefits, Rain Water Harvesting also slows and filters runoff and rain water is much better for your plants than treated city water. The simplest method of Rain Water Harvesting is through the use of a rain barrel. Rain barrels are very easy to install, just place one below an existing downspout and start capturing the water that would normally go down the drain! We recommend the RainXchange® Rain Barrel which has a 75 gallon capacity and includes a pre-filter, easy-to-use spigot and built in overflow. Larger Rain Water Harvesting systems can also be constructed using a sub-surface RainXchange® System. This system is a revolutionary design that combines a re-circulating decorative water feature with a sub-surface Rain Water Harvesting storage system. 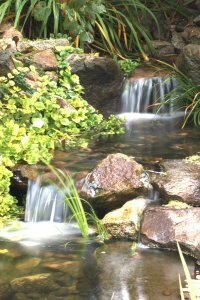 The clean, filtered water that is stored can be used for irrigation or to maintain the water level in the decorative water feature. 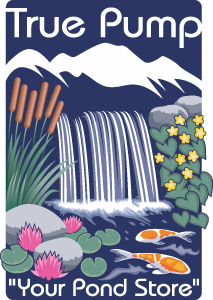 Colorado Water Law As of August 10, 2016 Colorado residents are allowed to capture up to 110 gallons of rainwater. Despite the wide array of benefits of Rain Water Harvesting those of us in Colorado have not been allowed to capture rain water previously due to existing water laws. The water that falls on your roof is not yours, someone downstream from you already has the rights to it. 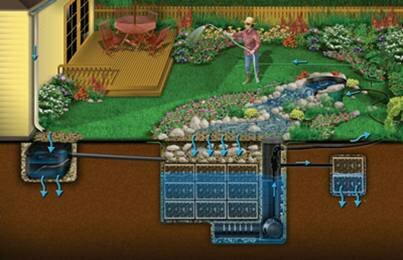 A homeowner that has a private well and is not connected to a municipal water supply can harvest rain water without restriction. The homeowner will need to apply for a special (no fee) permit from the state and is only able to use the captured water for the allowed uses that are shown on their well permit. True Pump carries the complete line of Aquascape’s Rain Water Harvesting products including rain barrels and the RainXchange® system. Call or email us today for a custom designed system to fit your specific needs.